Country music star Rory Feek's Tennessee farm is now the home of a one-room schoolhouse! Check out the finished building here! 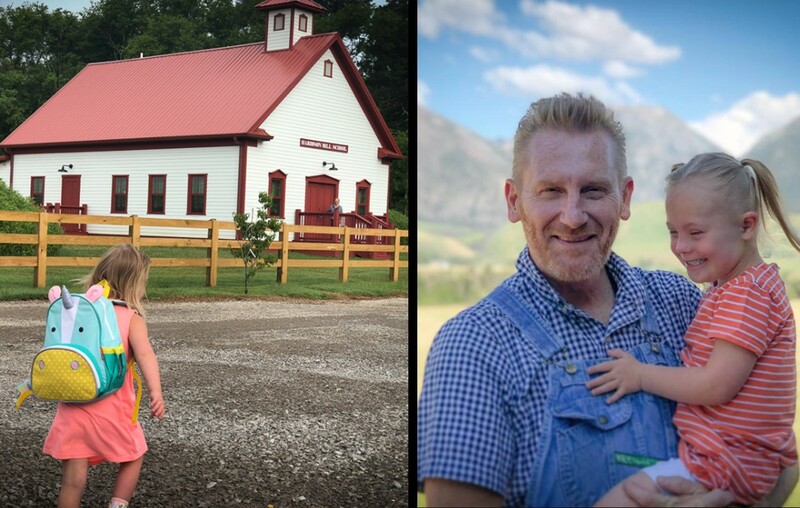 According to his latest inspiring blog entry, country music singer-songwriter Rory Feek and his tight-knit community of friends are preparing for school to start on the farm! That’s right, the one-room schoolhouse Rory talked about last fall is gearing up to welcome twelve young pupils (4-year-old Indy Feek being one of them) on September 10th— the day after the late Joey Feek’s birthday! The brand new Hardison Mill School takes its name from the area the family calls home, Hardison Mill, Tennessee. It also shares the name of the Feek’s homestead, which was first settled by the Hardison family. “It was humbling and amazing to see and feel the outpouring of love for our family from strangers. From people we’ve never even met and most likely never will. My hope at that time was that their beautiful gift would be used for a wonderful purpose, and it has,” the artist continued. Take a look at the schoolhouse’s building process and finished look below! Isn’t it just so perfect?! As of now, the school with act as a pre-school with hopes of eventually including a broader range of ages. Eventually, a playground and a garden with an orchard and a greenhouse, and a barn for animals will also be placed next to the school building. “On Sunday September 9th (Joey’s birthday), the day before the school opens, there’s going to be a special chef-catered, four course HARVEST DINNER in our back field behind our farmhouse. It will be catered by the wonderful folks at Kindred Farm, and I will play some music and share stories. I think it will be an evening of amazing food and fellowship, and it will all go for a good cause…the schoolhouse. There’s also going to be a big Celebrity Yard Sale in our concert hall (along with a big regular yard sale in the parking lot) on that Friday and Saturday, the 7th and 8th (from 7 am ’til 2 pm), where we (and a number of other celebrities) have donated some items for a fun event to help raise money for the school. By the way, Hardison Mill School also has an official Facebook Page where you can get updates and see more photos! Go here. We’re beyond thrilled for everyone involved in making this schoolhouse a reality and can’t wait to see little Indy with her classmates! These kids are going to learn so much! Share this heartwarming update with other fans of the Feek family!